Each round, light-beige soap is embossed with a cherry blossom design and rests on a bed of shredded, natural raffia. The cherry blossom soap measures 1/2" high and 2" in diameter. 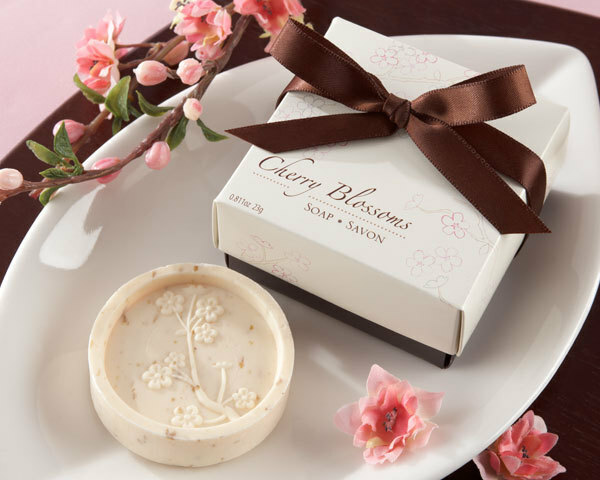 Its gift box features a chocolate-brown base, a cream colored top with a lovely pink and pale gray cherry blossom motif as well as the words "Cherry Blossoms Soap". It is then finished with a chocolate-brown ribbon and bow. Gift box measures 1 1/2"h x 2 1/2" square. Sample price of $1.45 is limited to 1 per customer/order. Please allow 5 business days to fulfill your pear wedding favors order; add ship time from GA.